ADTLE. Autosomal Lateral Temporal Lobe Epilepsy is a rare monogenic epilepsy that has epileptic seizures with auditory auras as the most impressive feature. This condition is caused in LGI1. In contrast to most other autosomal dominant epilepsies, LGI1 is not an ion channel, but a secreted protein that binds to synaptic cell adhesion proteins. Therefore, the function of LGI1 has always remained slightly mysterious. In a recent publication in Nature Medicine, the functional properties of two LGI1 mutations are modelled in mice. Allowing neurons to secrete altered LGI1 protein otherwise targeted for degradation helped recover some of LGI1’s function. LGI1 is secreted from the presynapse and binds to postsynaptic ADAM22. Binding to ADAM22 results in altered intracellular signalling in the postsynapse that decreases excitability, probably through subunit changes in postsynaptic glutamate receptors. Mutations in LGI resulting in lack of ADAM22-mediated signalling therefore result in a net increase in excitability. LGI1 mutations. While temporal lobe epilepsy is one of the most common epilepsy in humans, most temporal lobe epilepsies (TLE) are mesial with seizure coming from the hippocampal region. Mesial temporal lobe epilepsy has features such as epigastric auras, olfactory auras or deja vu that allow the epileptologist to clinically locate the seizure focus, which can then be confirmed by EEG or MRI. In contrast to the more common mesial TLE, lateral TLE may have auditory auras as a feature. Clinically, patients may hear sounds or even complex auditory hallucinations, either in isolation or prior to a complex partial or secondarily generalized seizure. Lateral temporal lobe epilepsy may run in families in an autosomal dominant manner, which is then called ADTLE (Autosomal Dominant Lateral Temporal Lobe Epilepsy) or ADPEAF (Autosomal Dominant Partial Epilepsy with Auditory Features). Mutations in LGI1 were discovered in families with ADTLE in 2002. However, in contrast to other gene findings in monogenic epilepsies at this time, the function of LGI1 remained unclear for a long time. LGI1 function. The LGI1 protein was found to be a secreted protein, which is released from the presynapse. The most robust binding partner of LGI1 is ADAM22, a postsynaptic transmembrane protein, which is thought to stabilize potassium channels in the postsynapse. Mice deficient in ADAM22 have similar seizure phenotypes as LGI1-deficient mice. Various types of mutations have been identified in LGI1, including truncation mutations and missense mutations. While haploinsufficiency (e.g. loss of one LGI1 copy) is the very likely genetic mechanism behind LGI1 in ADTLE, it has remained unclear how the LGI1 missense mutations produce such an effect. This is one of the questions that Yokoi and collaborators aimed to answer in their recent publication. Secretion. Yokoi and collaborators classified mutant LGI1 proteins into proteins that get secreted from the cell and proteins that are secretion-deficient. Some mutations may change the overall conformation of a protein to an extent that will make it impossible for the protein to pass the cellular quality check in the endoplasmatic reticulum (ER). These proteins are then targeted for internal degradation and will never make it to the cell surface for secretion. Other mutant LGI1 proteins are secreted, but fail to exert their action on ADAM22. Yokoi and collaborators generated two mouse models of LGI1 missense mutations, the secretion-deficient p.E383A mutant and the secretion-competent p.S473L mutant. For the secreted p.S473L protein, they could show that the mutation alters the ratio of monomers to dimers, leading to increased binding of LGI1 to itself. The mutant protein forms more than twice as many dimers as the non-mutated protein, suggesting that mutant p.S473L protein essentially neutralizes itself by binding to each other. However, the real revelation of the publication by Yokoi and collaborators was that the p.E383A mutant remained stuck in the endoplasmatic reticulum. 4PBA modification. The authors were wondering whether it would be possible to enhance secretion of p.E383A LGI1 protein when treating cells with chemical correctors. Chemical correctors, in the current context, are small molecules that influence the folding of proteins. They are also referred to as chemical chaperones. When Yokoi and collaborators screened an entire battery of possible chemical chaperones in a cell system they identified 4PBA (sodium phenylbutyrate) as the most effective chemical corrector. 4PBA is also evaluated for chemical correction of misfolded proteins in other disorders, including cystic fibrosis, where a common mutation leads to a similar cellular phenomenon as the p.E383A mutation. Mouse model. After Yokoi and collaborators established that 4PBA could increase secretion of the mutated p.E383A protein in cells, they generated a transgenic model of this mutation. The animal developed seizures compatible with other LGI1 mouse models. Treating the animals with 4PBA led to reduction of seizures, suggesting that the observed effect in the cellular model translates to the mouse model. Both this finding and their previous results from the p.S473L mutation, which leads to increased dimer production, lead the authors to the conclusion that some cases of LGI1-related epilepsies may represent a conformational disease, caused by alteration in protein structure. This is what you need to know. 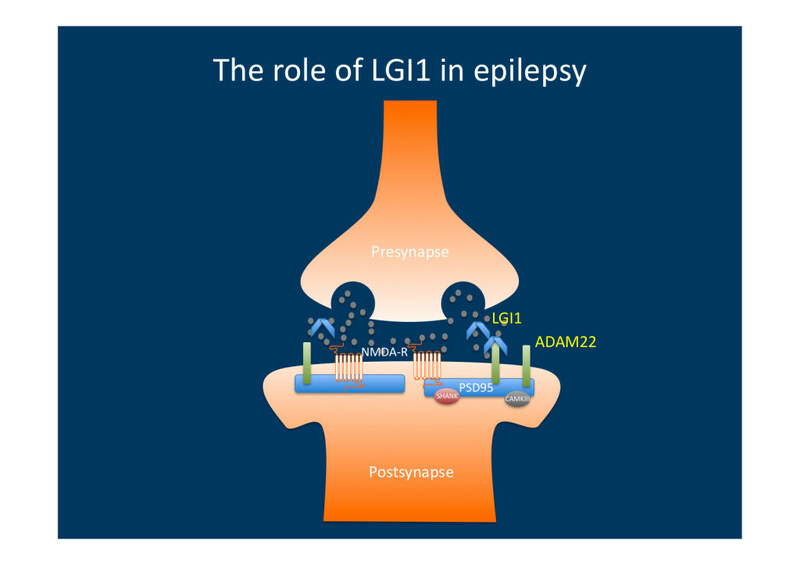 We’re slowly chipping away at the mysterious role that LGI1 plays in human epilepsy. The study by Yokoi and collaborators suggests that protein misfolding may lead to decreased secretion and/or decreased binding to the ADAM22 protein. The fact that this dysfunction may largely be due to conformational protein changes suggests that chemical correctors may be potential treatment options for these types of diseases. This entry was posted in 2014, Epileptic encephalopathy, Familial epilepsies and tagged ADPEAF, ADTLE, auditory features, auditory halluscinations, DEPDC5, focal epilepsy, haploinsuffiency, LGI1, LGI3, mTOR, NMDA receptor, partial epilepsy, PSD95. Bookmark the permalink.